"Snakes United" are our Division 1 champion, taking the league's top spot after a disappointing championship game exit last season. It was a tough road to take the championship, having to go through both "Team Iceland" and "Team 1". They brought their 'A' game though, defeating "Team Iceland" 2-0 thanks to a combination of stalwart defense and great goalkeeping. In the championship they took on the well-rested "Team 1", who had the fortune of the bye as the #1 seed. That didn't matter much to our champions though. Neither did the fact that they were 0-2 during the regular season to this team, dropping both games by just 1 goal. This time, when it mattered most, our champions were the winner, defeating "Team 1" by the score of 3-2. Congrats to "Snakes United" on the run from the #3 seed to the championship podium! "Hugh's Baby Blues" are our Division 2 champion, taking down the "Gunners" in a 2-1 dogfight. As the top team all season "Hugh's Baby Blues" had the first-round bye, and it definitely helped. 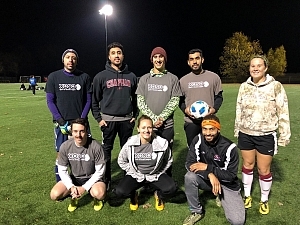 All season our champs were a force to be reckoned with, regularly defeating opponents by multiple goals. In fact, their +24 point differential was head and shoulders above the rest of the league. The "Gunners" finished second in that category with a +16. If it weren't for a forfeit loss late in the season, this team could very well have been perfect. Still, it was an impressive run to the top for "Hugh's Baby Blues". Congratulations on the dominant season! 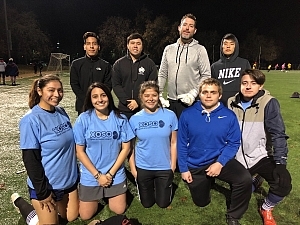 "The Pick Me Ups" are our Division 3 champion thanks to an offensive explosion in the playoffs. They put up 14 goals in 2 games, enough to overwhelm both opponents. Their first win of the night was an incredibly impressive 7-2 win over "Hangover 916", and that would set the tone for the night. They would eventually follow that up with a 7-4 defeat of the "Formerly In Shape Allstars". Our champs definitely showed a propensity to get hot offensively, scoring at least 5 goals in six of their nine games. Even more impressive were their game highs for the season, scoring 7 twice (both in the playoffs) and even hitting the 9 goal mark in one game. 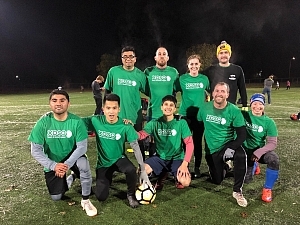 Congratulations to "The Pick Me Ups" on an incredible season and we wish them the best of luck in Division 2 next season!